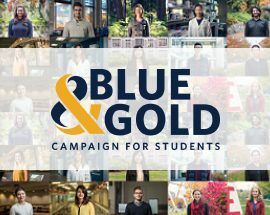 “I believe that contributing money to a university is one of the greatest gifts you can give,” says Amy Edwards, a second year student at UBC’s Okanagan campus and a recipient of the Deepak Binning Foundation Community Builder Scholarship. Amy received one of two $3,500 scholarships after being nominated by her high school teachers for her academic excellence and leadership skills. She enrolled at UBC as a B.Sc. student, but recently transferred to the Human Kinetics program, which she felt naturally gelled with a lifelong interest in health and personal training. Enrolling at UBC Okanagan was a no-brainer for Amy, who says she always planned to attend because it had an excellent reputation and allowed her to stay close to her home in Vernon, BC. Since becoming a part of the UBC community, Amy enthusiastically describes what she calls a welcoming “family” atmosphere, but emphasizes the importance the scholarship played in helping her adapt to university life. The Deepak Binning Foundation Community Builder Scholarship was named after Inderjeet Deepak Binning, who died of cancer shortly after graduating from Richmond’s J.H. Cambie Secondary School in 1999. His friends and family subsequently created the Deepak Binning Foundation in 2000, which endows two scholarships of $3,500 to students entering the Okanagan campus from high schools across the Southern Interior of BC.